Geometric problem, which is solved analytically using the methods of algebra are an integral part of school curricula. In addition to the logical and spatial thinking, they develop an understanding of key relationships between the entities of the world and the abstractions used by people to formalize relations between them. Finding points of intersection of simple geometric shapes is one of the types of similar tasks. Suppose that the two circles are specified by their radii R and R, and the coordinates of their centers are respectively (x1, y1) and (x2, y2). 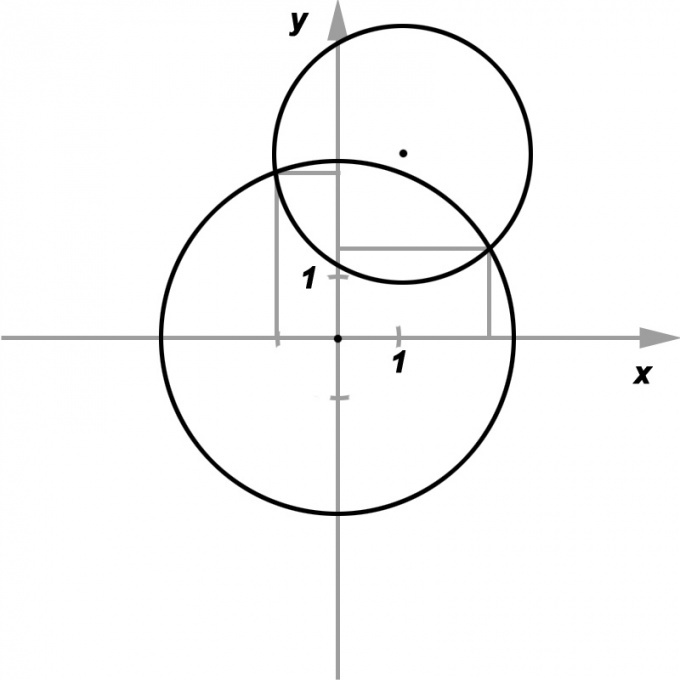 Want to calculate the intersect these circles, and if so, find the coordinates of the points of intersection.For simplicity, we can assume that the center of one of the specified circles coincides with the beginning of coordinates. Then (x1, y1) = (0, 0) and (x2, y2) = (a, b). It also makes sense to assume that a ≠ 0 and b ≠ 0. (x - a)^2 + (y - b)^2 = r^2. x^2 + y^2 - 2ax - 2by + a^2 + b^2 = r^2. Now the first equation can be subtracted from the second. Thus, the squares of the variables disappear, and there is a linear equation: -2ax - 2by = r^2 - R^2 - a^2 - b^2. It can be used to Express y in x:y = (r^2 - R^2 - a^2 - b^2 - 2ax)/2b. q = (r^2 - R^2 - a^2 - b^2)/2b - R^2. The roots of this equation allows to find the coordinates of the points of intersection of the circles. If the equation is unsolvable in the real numbers, the circles do not intersect. If the roots coincide, then the circles touch each other. If the roots are different, then the circles intersect. (x - a)^2 + y^2 = r^2. After subtracting the first equation from the second, it turns out:- 2ax + a^2 = r^2 - R^2.Its solution is: x = - (r^2 - R^2 - a2)/2a. It is obvious that in the case b = 0 the centres of both circles lie on the x-axis, and their points of intersection will have the same abscissa. This expression for x can be substituted in the first equation of a circle to obtain a quadratic equation relative to y. Its roots are the ordinates of the points of intersection, if any exist. In the same way have an expression for y, if a = 0. If a = 0 and b = 0, but R ≠ r, then one of the circles is obviously inside the other, and points of intersection do not exist. If R = R, of the circle coincide, and the points of intersection are infinitely many. (x' is (x1 + x2))^2 + (y' - (y1 + y2))^2 = r^2.The task thus reduces to the previous one. Finding the solution for x' and y', it's easy to go back to the original coordinates, making the equation for parallel transport.